This is a not a lease but a license. It does not create a legal interest in land. A license is less formal, and in certain circumstances, very useful. The property owner is effectively saying "OK, you can occupy my property for a while, but I can interrupt at any time and ask you to leave". To a property owner, the plus side is the extra control he retains over the tenant. To the tenant, there is increased flexibility. This document is exclusively for the use of a director of a company who effectively works. From home and wants to set up provision for claiming home expenses against taxable income. 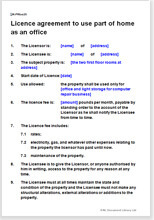 This document includes minimal and usual provisions in simple format.